Race Report: Shaun McBride (Omagh Wheelers). Ulster Junior Clodagh Gallagher claims her third straight race win from impressive field. 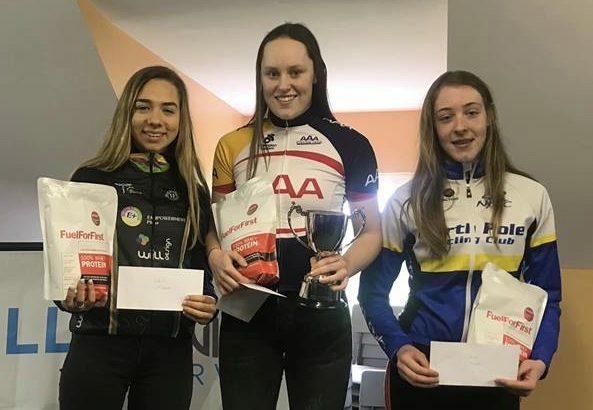 The Mc Cann Cup Women’s Road Race hosted by Omagh Wheelers was the first of two races where points in both the Ulster Women’s League and the Irish Intermediate Women’s League were up for grabs. As a result a great field of 37 Riders took to the start line, this included an impressive ten juniors. It was one of those Juniors (Eva Brennan, Deenside Wheelers) who attacked from the start and set a furious early pace which had a number of riders in early trouble. The riders faced a headwind as they turned at the green spot, and this was to slow the race right down, allowing some riders respite and a chance to catch the bunch. The second of three laps was a much steadier affair with fewer attacks. As they took the bell with 10 miles left to race Ewa Kuras (Arcane Women’s Team) launched a serious attack giving her a 20 second lead. This looked like it could be the decisive move of the day, and as the race approached the 5KM mark the Arcane rider still held a slim lead. Kuras was caught as the riders rounded Cairnlea Bridge for the last time, and the race would now be decided by a Sprint . In the sprint Gallagher from the AAA club in Donegal hit the front just before the 300m mark and was not to be headed. Junior Elia Tutty from TC Racing finished strong in second place with another junior Ciara Kelly rounding out the podium on a great day for juniors. Gallagher further increases her lead at the top of the Ulster League while on the National – The Ulster League moves on too Killinchy next Saturday. In the Intermediate League Lucy O Donnell holds on to the league leader’s jersey but is now under pressure from Elia Tutty and AAA’s Gallagher.